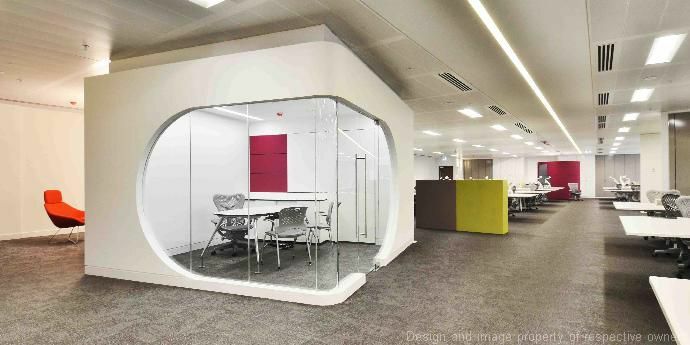 The new bwin.party HQ in London by Ranne Creative Interiors features wall cladding, circular entranceways, a statement reception desk and kitchenette countertops and doors made from Corian® high-tech surfaces. Images courtesy of Ranne Creative Interiors, all rights reserved. When the world’s largest listed online gaming company was formed by the merger of two major industry players to become bwin.party, the ‘dot’ that connected the new name style was also to become a key motif in the design of their impressive new Headquarters in London. Ranne Creative Interiors was chosen to envision the new space in Cheapside’s prestigious One New Change development and the design team in turn chose Corian® to help realise a bold, curvaceous concept. 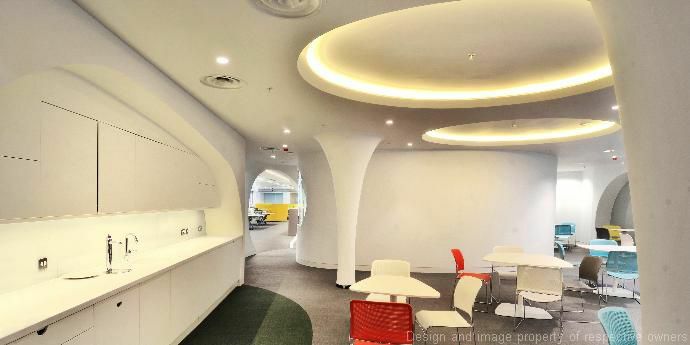 Inspired by the circular ‘dot’ theme, Ranne echoed this form throughout the design, including LED light installations in the ceilings and the spectacular tunnels and entrances to the meeting room suite, shaped from and entirely clad in Corian®. The seamless curving of the tunnels at bwin.party, achieved by highly skilled fabrication and fitting, is one of many decorative possibilities for Corian® high-tech surfaces that include digital printing, CNC engraving, backlighting, inlaying and many other dramatic effects. In each case, Corian® is renowned for making the right (and lasting) impression. With its sleek, tactile finish and sophisticated colour palette of over 70 choices, Corian® makes a distinctive surface solution that is both design and user friendly. At the bwin.party London HQ, a total of 74 sheets of the Corian® in the Glacier White colour have been installed. The new premises are now home to more than 200 staff, in a generous 20,000 sq.ft floorplate with a flowing layout that has been zoned into workspace, meeting rooms, reception, refreshment and recreation areas (including a fully equipped games room.) Further high-spec furnishings include Vitra Joyn desks, Herman Miller Mirra chairs and seating solutions from Boss Magic, Bene Parcs and Allemuir. Flooring finishes include poured resin in the reception area, Desso carpet tiles in the meeting rooms and Bolon woven vinyl in the open plan area. The design concept for the new HQ came together after a careful process that included consultation between the designers and the bwin.party workforce as to what they would hope to gain from the new workspace. By all accounts, since completing the move in December 2012, the occupants are delighted with their new facilities. Ranne Creative Interiors are now turning their attention to the bwin.party offices in Tel Aviv and Vienna.